NASA Earth Observatory image by Jesse Allen, using data from NASA/GSFC/METI/ERSDAC/JAROS, and U.S./Japan ASTER Science Team. Caption by Adam Voiland. Botswana ranks among the world’s top producers of gem-quality diamonds. In 2014, the southern African country produced $3.6 billion worth, according to data released by Kimberly Process, an international organization that records and certifies rough diamond shipments. With diamond production totaling $3.7 billion, only Russia produced more in 2014. 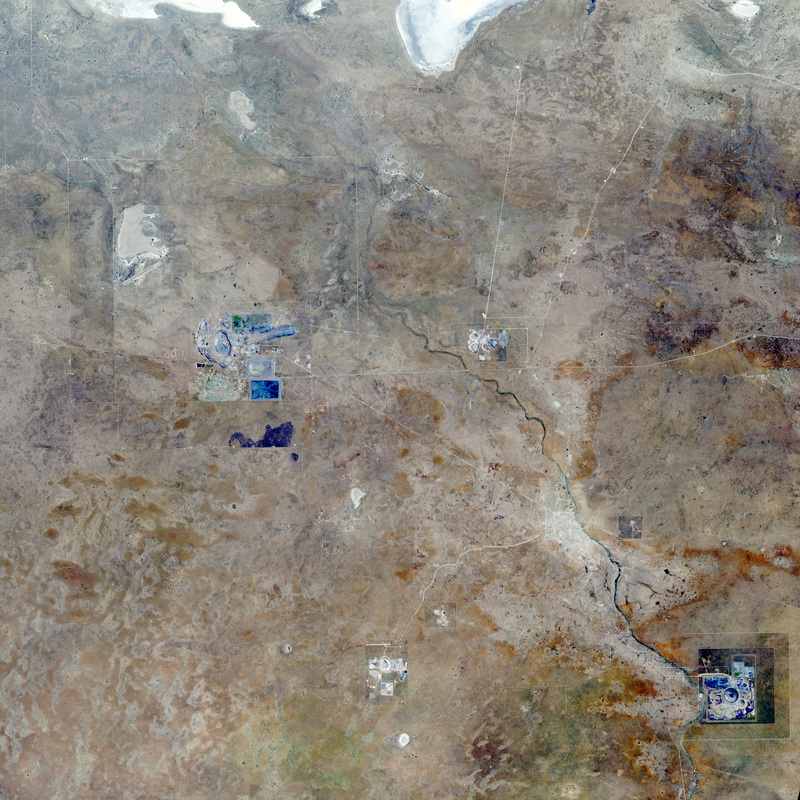 Many of Botswana’s diamonds come from the four mines shown in this image, which the Advanced Spaceborne Thermal Emission and Reflection Radiometer (ASTER) on NASA’s Terra satellite acquired on October 14, 2014. 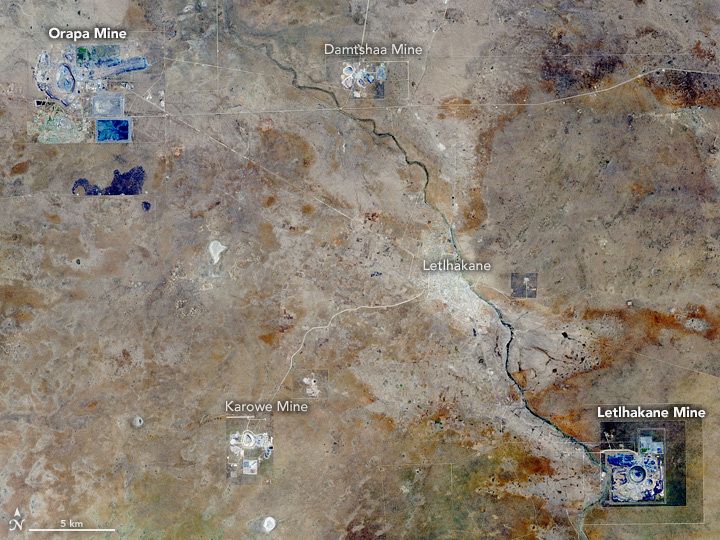 The oldest and largest of the four mines—Orapa (opened in 1971)—appears in the upper left quadrant. Letlhakane, the second largest, opened in 1975 and appears on the lower right. Damtshaa, in the upper center, opened in 2003. Karowe, in the lower left, opened in 2012. All four are open pit mines. They are made up of concentric roads that cut deeper and deeper into the ground. Support structures and other equipment surround the pits. (Download the large image for a closer view of the pits.) Orapa’s pit currently descends to a depth of 250 meters (820 feet); Debswana, the company that operates the mine, expects the pit to reach 450 meters by 2026. All of the mines are located on kimberlite pipes, a rare type of volcanic rock formation. In this case, the kimberlite formed about 90 million years ago when plumes of magma from deep in the mantle rushed upward during volcanic eruptions. As magma passed through an area about 150 kilometers (90 miles) below the surface—where pressure and temperature conditions are just right for diamond formation—it tore off chunks of diamond-containing rock and deposited them near the surface. Botswana’s diamond mines represent a significant portion of the nation’s economy. In recent years, the diamond industry was responsible for about one-third of Botswana’s gross domestic product, 50 percent of government revenue, and 70 percent of export revenue. However, there are signs that global demand for Botswana’s diamonds may be weakening. Botswana’s finance ministry recently reported that September diamond exports had dropped 63 percent in comparison to the previous year. Index Mundi (2015, November 6) Botswana: Economy Profile. Accessed November 25, 2015. Debswana (2015, November 6) Operations. Accessed November 25, 2015. IOL (2015, November 6) Diamonds aren’t forever: Botswana’s boom fades. Accessed November 25, 2015. Geology (2015, November 6) How do diamonds form? Accessed November 25, 2015. Kansas Geological Survey (2000, July) What are Kimberlites? Accessed November 25, 2015. Kimberly Process (2015, November 6) 2014 Production, Imports, Exports and KPC Counts. Accessed November 25, 2015. Mining Technology Orapa Diamond Mine, Botswana. Accessed November 25, 2015. NASA Earth Observatory (2008, October 26) Jwaneng Diamond Mine, Botswana.